After 6 decades of controversy and opposition, Sardar Sarovar Dam was recently opened in the Indian state of Gujarat. It is the world’s second largest dam, providing water and power to millions. After 6 decades of controversy and opposition, Sardar Sarovar Dam was recently opened in the Indian state of Gujarat. It is the world’s second largest dam, providing water and power to millions of people across 3 dry states. But the dam is threatening to drown 192 surrounding villages, and local communities are up in arms, launching dangerous protests in the hope of saving their homes. Shuriah Niazi reports from Madhya Pradesh. On 17 September, 2017, the Indian Prime Minister Narendra Modi opened Sardar Sarovar Dam. It’s over 55 years since the project’s foundational stone was laid by country’s first Prime Minister Jawaharlal Nehru in 1961. The dam has faced widespread opposition and controversy ever since. The World Bank offered a loan of 450 million US dollars for the construction of the dam, but pulled out in 1993 following long running environmental protests. India pushed on with it. The dam’s construction is drowning 10 thousand hectares of forest, and nearly 30 thousand hectares of farming land. And it’s threatening to submerge hundreds of villages. 48-year-old Harinder Patidar from Nisarpura village has lived under the shadow of the dam his whole life. Although it’s already opened, the dam isn’t yet filled to capacity. But as its water level rises, surrounding villages are flooding. If the dam is filled up, 192 villages will be entirely under water. 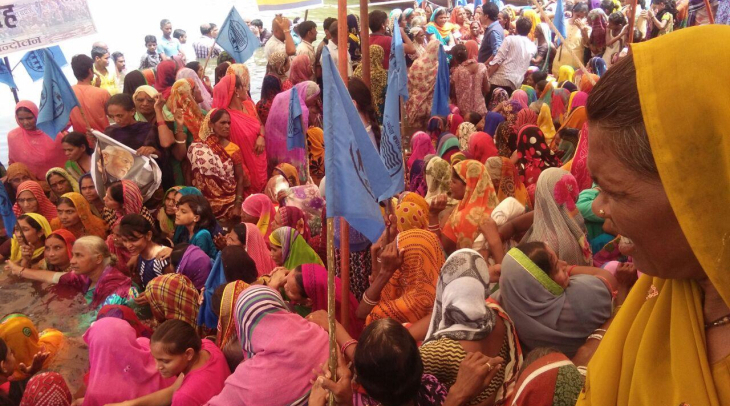 “Fifty per cent canals of Sardar Sarovar have not been completed,” explained activist Medha Patkar. She has been fighting the Sardar Sarovar dam since 1985, and leads the Save Narmada Campaign (NBA). “Forty thousand families in the submergence area have not been resettled. How can you say the dam has been completed? A dam is not just a wall,” she said. Medha Patkar claims that the dam was opened early to try to win votes ahead of upcoming Gujarat state elections. Sardar Sarovar is the largest of 30 irrigation and hydroelectric projects being built on the Narmada River. The dam promises to irrigate over 1.8 million hectares of land, especially in drought-prone parts of Rajasthan and Maharashtra. It will provide drinking water to almost 10 000 villages and 131 urban centres, and it will generate 1450 megawatts of electricity annually. Prime Minister Modi opened the dam dedicating it to the nation. But people living in the area are far from happy. They’ve been protesting for decades, going on hunger strike, and staging sit-ins. Now they sit immersed in water up to their shoulders, in a dangerous protest known as Jal Satyagaha or water struggle. The majority of those affected by the dam are farmers and Adivasi, or tribal people. They’ve been told to vacate their houses and shift to temporary tin sheds provided by the state government. But they refuse to abandon their land, their livelihoods and their homes. Chandra Shekhar is one of those staying put, even as his home village of Sudol sinks under water. “If we lose the land we lose our livelihoods,” he told me. “We are not getting adequate compensation. The place we have been asked to move to doesn’t have basic facilities. We would have to spend about a million rupees to build a house, and we are not getting enough compensation for that. We will only move to a place that has facilities and means of livelihood,” he explained. As the dam continues to slowly fill up, villagers are still waiting for promised compensation and a resettlement offer that they can survive on.